Welcome to Rocko’s Rewards ! 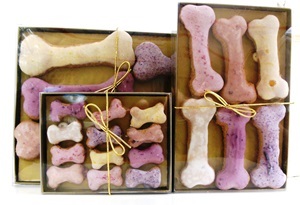 In 2007, amid widespread issues with contaminated pet food, I started making Rocko his own all natural dog biscuits. As we shared them with family and friends, it was obvious we had something special and Rocko’s Rewards was born. All of our products are hand made using the highest quality human grade natural and organic ingredients, baked fresh and delivered Fresh to your Dog®. The safety of your dog treats is our top priority. Our biscuits . . .
Rocko’s Rewards traditional hard all natural dog biscuits are available in a reclosable bag of 32 in your choice of Original Beef or Sweet Potato flavors, with four sizes perfect for any dog. We always offer FREE SHIPPING to make easy to keep your dog happy! All biscuits are hand made, size and appearance may vary from picture. Order Now! Thorsted Gyncuits (pronounced thor-stéd gin-kits), Thor & GynGyn’s fruit frosted all natural dog biscuits, are quite possibly our best creation ever! Thorsted Gyncuits are the perfect gift for the special dog in your life. Our ingredients . . .
Rocko’s Rewards are made with the same ingredients you would find in your own kitchen, all from reliable US sources – nothing is imported. For a list of ingredients and a nutritional analysis for each of our products, click here. Want to keep up with what’s going on at Rocko’s Rewards and the adventures of Thor & GynGyn? Yes, that’s really Rocko on every package of our all natural dog biscuits.